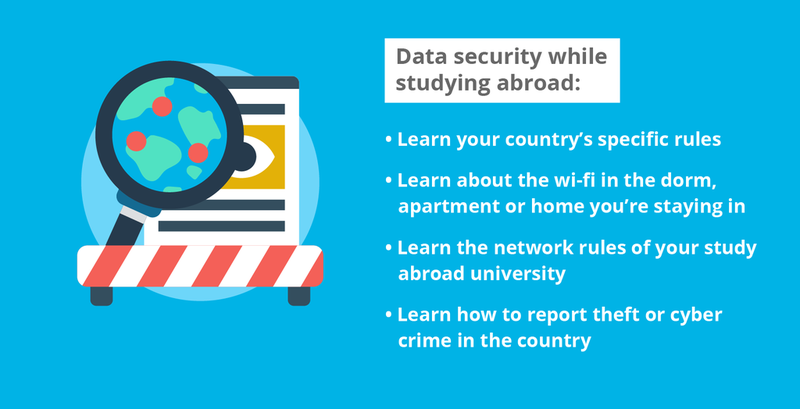 Studying abroad can be a wonderful, life-changing opportunity but it pays to be aware of the risks to your data security while travelling or living in another country. This comprehensive guide tells you all need to know to stay safe online, protect your personal information and avoid any inadvertent trouble with the authorities while you’re away. Studying abroad may be an incredible once-in-a-lifetime experience, but wherever you are, staying connected online can be a literal lifeline. Using the internet always comes with risk, even more so when you’re abroad, using unfamiliar WiFi networks and where internet laws may be very different to the ones you are used to at home. Lack of preparation could leave you the victim of a hack, identity theft or even subject to harsh penalties including jail time. The good news is that this guide provides you with all the up-to-date information you’ll need – all in one place. You’ll be introduced to the online risks you might face, and equipped with the information you need to protect your data and to stay safe online during your time abroad. We’ll cover what you should do before your trip, the precautions you should take whilst you’re away, and the safety measures you can take when get home. You’ll find everything you need to know about the basics of internet safety, from the dangers you face using public WiFi and the importance of encrypting your files, to how to report a cyber crime when you’re abroad. We’ll also help you set up your devices for maximum security, and explain how you can protect yourself against threats including security vulnerabilities, location tracking, password interception and data theft. Traveling or studying abroad in a new country is an exciting opportunity. However, doing so comes with certain risks, especially with regard to data security. There are several steps you should take when preparing for your trip abroad to ensure that your data will be safe during travel. Each country has its own laws regarding internet use. Many countries have different laws regarding censorship, advertising, surveillance and file sharing. Make sure to research the internet laws of the country or countries you’re visiting. Before you leave, visit your country’s government website to learn more about the laws in the country you’re traveling to (such as the U.S. State Department website or the UK government website, which both give foreign travel advice). By knowing the laws of the country you’ll be in, you can plan data security measures to take ahead of your trip, avoiding any unpleasant surprises while abroad. It’s important to note that in many countries, you can’t expect the same level of internet privacy as you can in the United States. Depending on the country, electronic communications and phone calls can be monitored by surveillance agencies. As such, you should be mindful of the type of information you’re sending and receiving while abroad. While you should never send private or sensitive information over unsecured servers like public WiFi spots, your privacy may not be guaranteed on secured networks, either. As a rule, never send sensitive information or information you wouldn’t want unintended parties to read over the internet. Before leaving the country, you should perform a full backup of you any devices that you’re taking with you. This minimizes the risk of permanently losing information if your device is lost or damaged while you’re abroad. Additionally, if your device is stolen, you can use this backup to determine what sensitive information the perpetrator may have access to. You can backup your computer using an external hard drive or a secure cloud-based service. The benefit of using an external hard drive is that it doesn’t rely on internet service when backing up files. External hard drives are small, easy to use and relatively inexpensive. Another way to backup your device is by storing your files in the “cloud.” A cloud-based service backs up your system on an online server, which is accessible anywhere with internet access. These cloud-based backups are not the same as cloud services like Dropbox and Google Drive, because they provide a backup for your entire system, not just copies of certain files. As a student, a lot of your important data is stored on your devices. If you’re traveling to a country with particularly strong censorship or surveillance, you should remove all sensitive information or data except for what is needed during travel. This minimizes the risk of the data being stolen or intercepted (in the case of censorship or device theft). It also lowers the chance of your information being stolen or copied as you go through customs. If you’re studying abroad, keeping such data off your device for an extended period of time may be difficult. However, it’s recommended that you delete the data before traveling to the country; you can reinstall it onto your device once you and your device are safely through customs. Before traveling, make sure any electronics you’re taking with you are fully updated. This keeps your electronics running smoothly and ensures that all security patches are up-to-date, making the devices less susceptible to security breaches and hackers. This applies to both Mac and PC users; even on a Mac, you’re susceptible to viruses, malware and other harmful files. Make sure you have robust anti-virus software installed on your devices. There are a number of different anti-virus software companies, including Total AV, PC Protect, Norton and McAfee. If you already have anti-virus software installed, make sure you update it to the most current version before you leave. Even if you already have a strong password, you should consider creating new ones for your most sensitive accounts before going abroad. This is especially important for your school passwords, as these often expire and having to reset passwords in an unsecured area could pose a security risk. 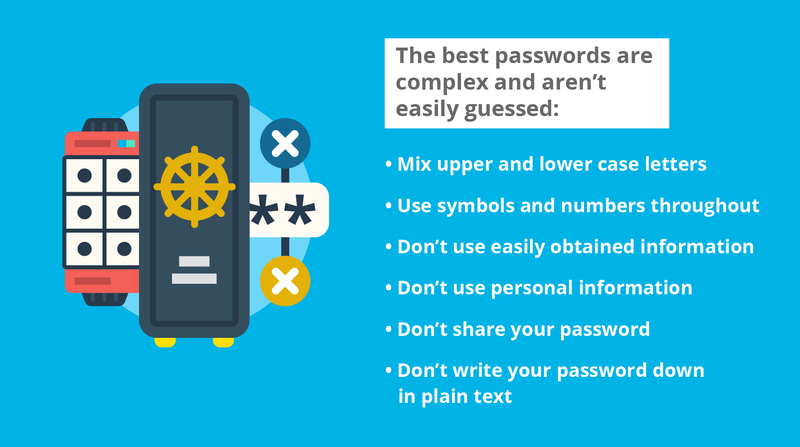 It’s also important that you don’t use the same password for every account. This minimizes the risk of a hacker or government entity gaining access to multiple accounts. You can use password management software, such as LastPass or Dashline to keep track of different passwords as well as keep them secure. These software applications can store and encrypt your passwords, or create new, safe passwords for you. In addition to the tips above, there are several steps you can take to ensure that your devices are secure while you’re abroad. For example, you can install a privacy screen in your laptop. This helps prevent people from gaining access to sensitive information on your screen and is especially important if you’re studying abroad, as you’ll be using your laptop in unfamiliar, and possibly unsafe, places. If your devices contain apps or software that you no longer use, delete them. This is particularly important for applications like social media, which may store personal information or other data you’re unaware of. One of the most important things to do before you travel abroad is encrypt all your files. In the event that your device is lost or stolen, this will keep your private information and sensitive data secure. You can easily encrypt your files by opening their properties clicking “encrypt content to secure data” as well as adding a password to access the file or files. Additionally, limit the information you store on USB drives and other removable media. USB drives, while convenient, are easy targets for thieves and hackers. If stolen, they allow access to anything stored on the drive. One of the most important things to do before you leave the country is sign up for a Virtual Private Network (VPN), and get it set up across all the devices you’ll be taking with you. A VPN is essential for keeping your data protected while traveling, especially when going to countries with strict censorship laws. Depending in where you’re going, certain VPNs may not be permitted, so it’s essential that you ensure the VPN you sign up for works in the country you’ll be visiting. Data security continues once you’ve arrived at your destination. It’s important to be vigilant while you’re abroad, to ensure that you don’t open yourself up to security vulnerabilities or violate the country’s internet or censorship lawns. While abroad, a VPN is the best way to ensure that your communications are private. A VPN creates an encrypted connection to the internet via a remote VPN server that can be anywhere in the world, replacing your IP address in the process. This not only protects your data but also hides your identity and allows you to bypass censorship measures. It’s important to note that some countries with strict internet laws, such as China, Russia and Turkey, may only allow approved VPNs, or none at all. Make sure to check which VPNs are and are not allowed in the country you will be staying in. Additionally, while VPNs allow you to access restricted sections of the internet, you should be cautious when accessing any content that the country’s government would not approve of. While you’re abroad, you should avoid using public, unsecured WiFi networks like those in hotels, airports and coffee shops, as they’re often subject to surveillance. Additionally, hackers often set up fake WiFi hotspots that mimic real ones (a tactic known as an “evil twin attack”) in order to steal your information. Using a VPN is essential when connecting to public WiFi networks, as it’s the only way you can ensure that the data you send is protected. Unless you’re connected safely through a VPN, you should always assume that your connection is insecure and possibly monitored. Even when you’re in your own device, you should avoid sending sensitive information over text, social media messengers or email. Due to the sophistication of hackers, coupled with each country’s surveillance and censorship laws, it’s a good rule to assume that if it’s being typed and sent over the internet, it can be seen. To avoid needing public WiFi, use a personal hotspot that only you have the password to or use a secure data plan. 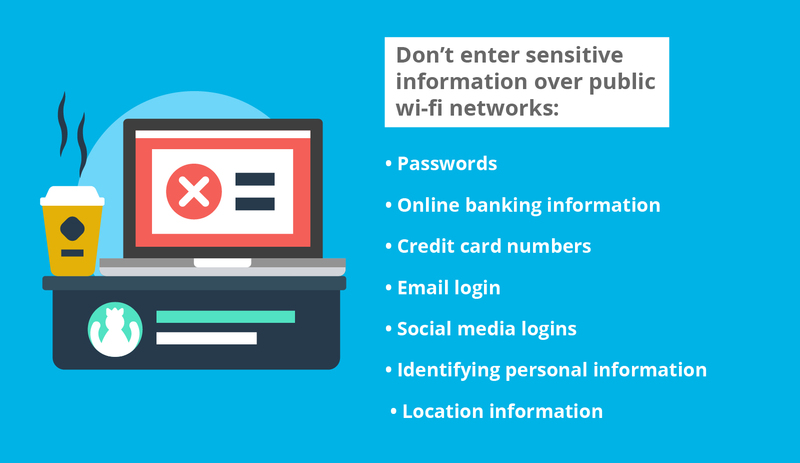 If you absolutely must use a public computer or an unsecured WiFi network, avoid sending sensitive information or personal information, and make sure to delete everything that belongs to you off of the computer when you’re finished. 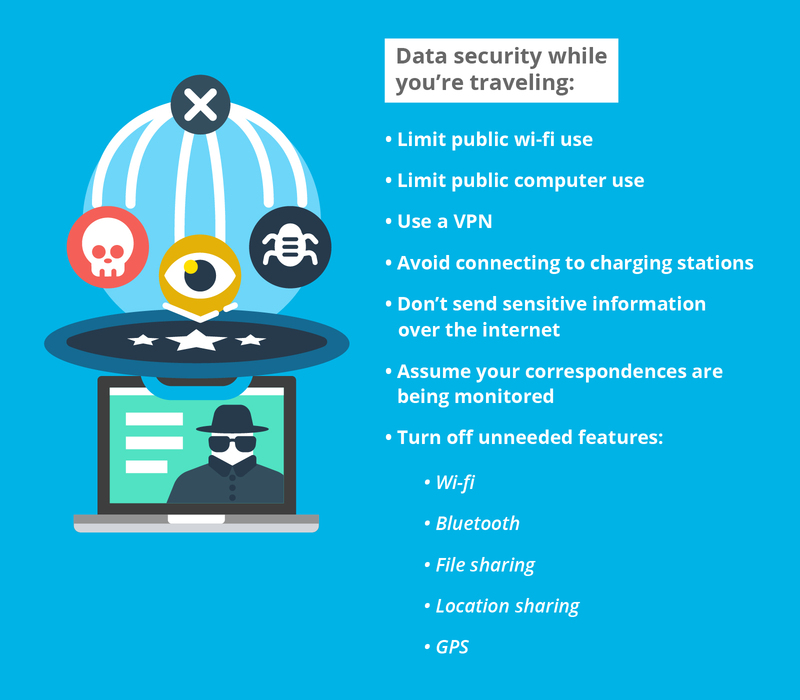 There are several extra steps you should take while you’re traveling to ensure that your data is protected. Steer clear of public USB chargers and other public electronics, which may house harmful malware files and viruses. Additionally, turn off features you don’t need, such as automatic file sharing, bluetooth and WiFi. These features can be used by hackers to steal information or plant malicious content or viruses. You should turn off your location tracker as well. If someone has access your device and your location services are running in the background, they will be able to find your physical location. As a student studying abroad, the internet and electronic devices are indispensable: you’ll use them to do homework, make travel plans, keep finances in order, connect with your family and friends back home, and more. As such, you need to take few extra precautions to keep your data safe. When studying abroad, it’s especially important for you understand the laws of your host country, as the laws of certain countries can put you at risk when it comes to posting online. Depending on where you’re studying abroad, certain types of posts in social media could cause legal retribution. For instance, if you’re in Turkey, simply tweeting or posing anything critical of President Tayyip Erdogan could cause legal ramifications, including spending time in a Turkish jail. Russia is also very sensitive about online criticism of the government or political system. In China, posting “politically sensitive” content can land you a fine, detainment, or in some cases, in jail. Remember, you are not protected by the same free speech laws in some countries as you are in the United States. Be sure that you understand the laws of the country you’ll be staying in, including laws regarding free speech online, and be careful about what you post in social media and other identifying websites. Additionally, every country has their own sets of laws governing internet use. Countries such as China, Turkey and Russia have strict censorship laws and firewalls that block access to certain websites. In China, as many as 130 of the internet’s most popular 1,000 websites are blocked. These include websites you may use every day at home, including Google, Facebook and YouTube. The government actively monitors the internet and any breach of conduct are met with harsh punishments. Additionally, countries block access to sites that provide information about democracy or other political, social, cultural or religious content, so it’s important to be careful what kind of information you’re looking up, downloading and uploading. Unlike students who are simply traveling abroad, it’s difficult to avoid using WiFi connections when you’re studying abroad in a country for an extended period of time. As such, it’s imperative that you learn about the WiFi situation in the dorm, apartment or host house you’ll be staying in. If you’re staying in a university dorm or with a host family, you should determine who has the ability to monitor your communications — and what they can see. Just like your college at home, the university you’ll be studying will have their own electronic communications policy. However, your host university will likely have different rules regarding internet use than your university at home, including how and what data they can monitor. To better understand your data rights while abroad, familiarize yourself with these rules, and get acquainted with the university’s IT department. Proactively protect yourself by learning how to report data theft or a cyber crime in your host country. Your university’s internet policy will likely cover what to do in the event of cyber crime; be sure to familiarize yourself with their specific rules so you can follow protocol in the even that such a crime occurs. You should also learn how to contact your host country’s police, as well as your home country’s embassy. Once you return home, there are a few things you need to do with regard to your data safety. First, make sure you have all the devices you took with you scanned for spyware and malware. Keep of all of your known and secure networks until you’ve determined that your device hasn’t been compromised. If malware is found, remove it safely and restore the device from the backup you created before going abroad. As an extra precaution, you should change the passwords to the accounts you accessed while abroad. This minimizes the risk of data theft in the case that your passwords were intercepted while abroad. Once home, continue to monitor your accounts for for suspicious activity or transactions you didn’t authorize. This kind of suspicious activity indicates that your personal information was compromised at some point during your travel. Don’t forget what you learned about data security just because you have returned home. You may feel safe when you’re back on your secure connection, but your sensitive data is at risk at home as much as it is while you’re abroad. 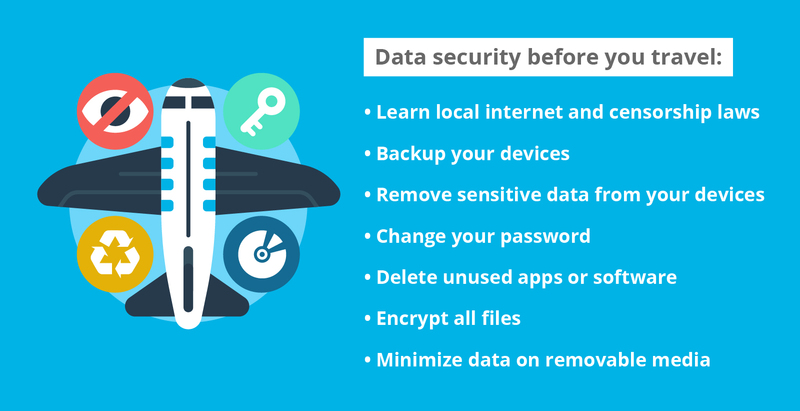 Once you’re back at your university, be sure to take certain steps to keep your data safe. Keeping your data safe while traveling or studying abroad is about being aware of and prepared for security risks. There are a number of ways people can access your sensitive data and information if you don’t properly protect it. However, if done correctly, data can be kept secure and private from government surveillance and hackers. Know the internet and censorship laws of the country you’re visiting. Backup your data before travel. If you lose your data and don’t have a backup, it will be permanently lost. Configure your devices up for maximum security. Use a VPN to encrypt your transmissions and hide your location. Avoid public computers and WiFi. Don’t send sensitive information over the internet while abroad. Turn off any extra features you don’t need, like bluetooth and location tracking. Be aware of your internet use, and who it may be watching or listening. Scan all your devices for malware once returning. If you find that any of your devices have been compromised once returning, remove affected data and reconfigure if necessary.